Small size UK Airborne forces 'Pegasus' patch in blue on maroon. The design depicts 'Bellerophon' the first Airborne Warrior, astride the winged horse 'Pegasus'. This beloved emblem of British Airborne Forces dates from their formation in 1940. 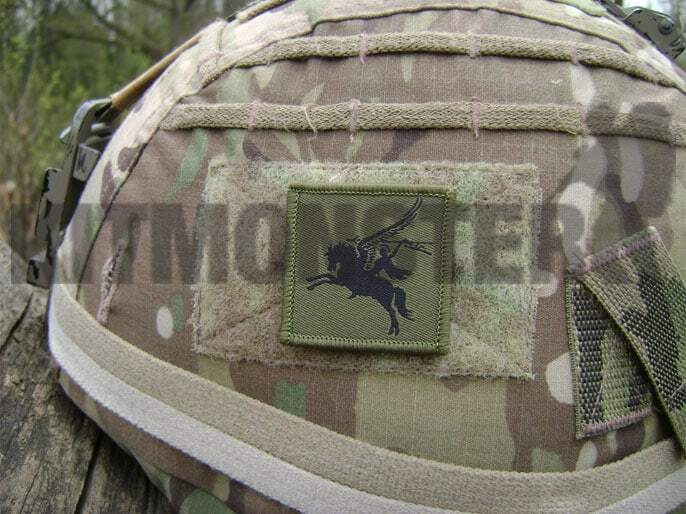 UK sourced from the MOD contractor, this is the officially approved 2015 design for 16 Air Assault Brigade, but in a reduced size ideal for helmets and other non official locations. 4 x 4cm Velcro backed badge, flat woven design with bound edge, ideal size for helmets. Helmet & cover for illustration only, these are not included.